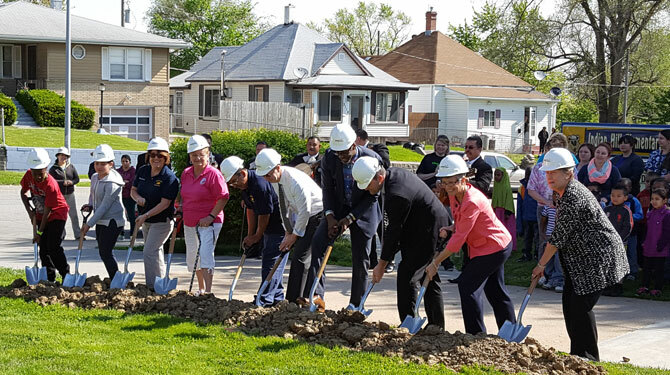 The groundbreaking ceremony for Omaha Public Schools’ Indian Hill Elementary School took place on May 5th, 2016. Schemmer’s Terry Wood, AIA, LEED AP, Project Manager and Molly Macklin, Assoc. AIA, Architectural Designer, were in attendance. Included in the renovations that Schemmer is designing for Indian Hill are fire, life safety, security and technology upgrades. Capital improvements include providing central air conditioning to the entire facility. Molly Macklin and Terry Wood with Lund-Ross Constructors and Omaha Public Schools personnel. OPS Superintendent Mark Evans is 2nd from left.